Now that you are pregnant, you have many decisions to consider. One of the most important ones is how you are going to bring your new little one into the world. Over 30% of births in United States are c-sections (cesarean sections) now. The chances of having your baby via cesarean during your labor and childbirth is not insignificant; it is important to learn about the risks of cesarean sections and why you might need one. A cesarean is a surgical birth. An incision will be cut into your abdomen at the top of your pubic hair; a second incision is cut into the uterus as well. Cesarean sections generally take about an hour to an hour and fifteen minutes from the first incision to the end of the repair work. The baby is usually born within five to fifteen minutes after the first incision. If possible, you will be awake for the procedure; you will be given an epidural or a spinal for pain relief. Epidural or spinal medicine is better for you and the baby than general anesthesia. However, if your epidural does not work properly or you need an emergency c-section you will receive general anesthesia. Both mothers and babies tend to do well after a c-section. There is quite a bit of postoperative pain and you will probably require pain medicine for a week or more after the birth. Breastfeeding may be a challenge and you should talk to your nurse about good breastfeeding positions with your incision. Most Cesareans occur because of urgent or emergent health situations during the birth process. You may receive a c-section for one of the following reasons. Women that have to have a cesarean section for failure to progress often have no idea why, or what went wrong during their labor. Failure to progress occurs when dilation stops progressing. You also may require a surgical delivery if your membranes have been ruptured for over 24-36 hours or if you develop a fever. Malpresentation occurs when how the baby lies within the uterus makes a vaginal birth unfavorable. Examples include breech presentations, transverse lies (when your baby is sideways), face or brow presentations. A malposition may include occiput posterior position (OP) or asynclitism (when the baby's head is not tilted to fit through the pelvis). This is called cephalo-pelvic disproportion (CPD). CPD is rarely diagnosed and is a very rare condition. It often cannot be diagnosed because as pregnancy continues, the joints and ligaments of the pelvis loosen to create even more room for the baby to move downward. In addition, using positions for delivery that increase the pelvic outlet can help the baby's head fit through the pelvis. Doctors can see your baby is in fetal distress by monitoring the baby's heat rate on the fetal heart monitor. If your baby's heart beat decreases for a certain amount of time (called a deceleration), your baby could be getting less oxygen, causing damage to the brain and other fetal organs. 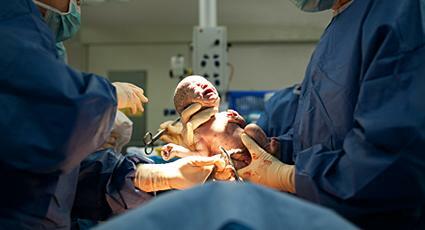 Babies with certain birth defects may be helped by having a cesarean. For example, surgical delivery may be safer for babies with spina bifida or severe hydocephalus. Many of these pregnancies require a c-section. Twins can be born vaginally if they are in the correct (head down) position, but triplets or more are usually delivered surgically because it is safer. This occurs when your baby's cord falls through the cervix in front of your baby's head. The cord then gets compressed either by your baby's head or body, cutting off oxygen to your baby. This is an extremely serious, though rare, condition and if this occurs, you will have an emergency cesarean. Placenta previa occurs when the placenta either partially or completely covers the cervix. If this is diagnosed early, the mother will need close monitoring and bed rest to lower the risk of premature labor. This is when the placenta prematurely separates from the uterine wall. This can cut off oxygen to your baby or cause hemorrhage. Depending on when and how much the placenta separates determines how quickly you need the cesarean. In this condition, the mother has extremely high blood pressure during pregnancy. Delivery of the baby as soon as possible is often part of the treatment, and a cesarean may be needed if the baby is in distress. Some mothers make the choice to have a c-section - for medical reasons or sometimes for non-medical reasons. A c-section may be safer for the mother or the baby. If you have a maternal disease or condition, you may need a cesarean. Heart disease, uterine fibroids, herpes sores, or HIV are examples of these. In these cases, you can schedule the procedure ahead of time. The delivery is usually scheduled around the 38th or 39th week. The doctor wants to make sure the baby is fully developed to minimize the risk of complications, but he/she also does not want labor to begin before the surgery and force the situation. These are also called parent choice c-sections. In these cases, the mother does not have a condition that requires that she would benefit from a surgical delivery but she decides to have one anyway. The parents can schedule the procedure at a more convenient time and make sure that family members can be present as needed. Elective c-sections are controversial because of the increased risks of surgery; others feel that birth should be allowed to occur normally whenever possible so elective c-sections are not the best option. If you want to have an elective c-section, you have to discuss it with your physician. Since this is a major surgery, there are potential complications - both minor and major - that you should be aware of. Minor complications are more common than major complications when you have a c-section. The most common minor complication is the longer recovery period due to pain from the incision site. You may have difficulty lifting your baby and taking care of older siblings. You will also be in the hospital longer as well. Because it does take longer to recover, most maternity disability laws allow women who give birth by c-section extra time off work. Excess gas in the abdomen: Because your abdominal wall will be opened up during the surgery, you may experience air in the abdomen after the surgery. The gas will slowly disappear and so will the discomfort. Constipation: Constipation for a few weeks after having a c-section is common because you may be afraid to bear down during a bowel movement due to the pain. Incontinence: Incontinence is the unfortunate occurrence of leaking urine, gas, or feces when you do not intend to. This may also be a problem after giving birth vaginally due to the heaviness of the baby on the pelvic floor during the entire pregnancy. Incontinence usually resolves itself in a few weeks or months, as you get stronger. Difficulty breastfeeding: Your breasts produce milk normally after having a cesarean, but the discomfort of placing the baby up to the breast due to incision pain may cause difficulty. Continue to place the baby to the breast and the pain will subside and should resolve itself as you heal. Infection: Inflammation and infection of the incision may occur. If your stitches start to swell, become painful even though they were getting better, smell foul, or emit a discharge, they could be infected. Remember the incision is inside the uterine wall as well, so you may not see any outward symptoms on the skin. If you have uterine pain or foul smelling discharge when you had been feeling better, see your doctor. Blood clots: The risk of developing a blood clot in a vein in the pelvic organs or legs is always a concern after any surgery. The problem can be life threatening. Getting up and walking soon after and frequently after surgery reduces this occurrence. Damage to other organs or the baby: Very rarely, the baby or other internal organs may be cut during the incision process of having a c-section. Reaction to anesthesia: Severe allergic reaction to the anesthesia is possible. Minor reactions to anesthesia such as headaches do occur as well. Increased likelihood of another cesarean for the next birth. While there are some potential complications associated with cesarean deliveries, most women -- with time -- recover well. If you have had a cesarean previously, you may need another one. However, you can talk to your doctor about trying to have a VBAC (vaginal birth after cesarean). You need to have this discussion earlier in your pregnancy so that your doctor can evaluate and make plans if a VBAC is appropriate for you. VBACs are less common due to hospital and doctors' fear of a ruptured uterus. In rare circumstances, especially if it is an emergency, a vertical line from naval to pubic bone will be used to get the baby out quickly. This scar will always be more visible and may make it difficult to have a VBAC in the future. Even if you have a c-section, you can still make the birth as special as possible. Ask your doctor if you can have a support person with you to support you and your baby. Talk to you doctor about having music playing or the lights dimmed around your head. If possible, ask to see your baby as soon as possible after the birth and see if your baby can stay with you during the repair work.